The 2017 Abu Dhabi HSBC Golf Championship golf tournament on the European Tour is taking place this week from January 19-22, 2017, at the Abu Dhabi Golf Club located in Abu Dhabi, United Arab Emirates. Here is a list of the prize money up for grabs at the 2017 Abu Dhabi HSBC Championship. 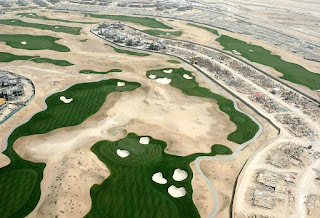 The Abu Dhabi HSBC Golf Championship dates back to 2006. Martin Kaymer from Germany holds the record for most wins with three (2008, 2010, 2011). Paul Casey from England is second with two wins (2007, 2009). American Rickie Fowler won the Abu Dhabi HSBC Golf Championship last year in 2016, and Rickie Fowler is back in 2017 to try and defend his title. Also playing in the 2017 Abu Dhabi HSBC Golf Championship is highly ranked fellow American and 2016 U.S. Open champion Dustin Johnson. Total prize money up for grabs at the 2017 Abu Dhabi HSBC Golf Championship is $2.7 million. The same amount of prize money as last year. The winner of the 2017 Abu Dhabi HSBC Golf Championship will earn $446,480. As mentioned above the winner of this tournament last year was Rickie Fowler from the United States. Second place is worth $297,653 at the 2017 Abu Dhabi HSBC Golf Championship. Thomas Pieters from Belgium finished alone in 2nd place here the last year. Third place at the 2017 Abu Dhabi HSBC Golf Championship is worth $167,700. Two golf powerhouses in Henrik Stenson from Sweden and Rory McIlroy from Northern Ireland tied for 3rd place here last year. Fourth placed is worth $133,944 at the 2017 Abu Dhabi HSBC Golf Championship. Fifth place is worth $113,585 at the 2017 Abu Dhabi HSBC Golf Championship. Jordan Spieth from the United States, Branden Grace from South Africa, Joost Luiten from the Netherlands, Alejandro Canizares from Spain, Byeong Hun An from Sotuh Korea and Marcel Siem from Germany all tied for 5th place here last year.